First Class Scout requirements include learning to tie a clove hitch and the timber hitch as well as the shear, square, and diagonal lashings (requirements 3a, 3b, 3c, and 3d of the new requirements). Pioneering turns the knowledge of ropes and lashings into practical application. As an EYO Scout leader, I not only wanted the boys to learn to tie these knots and lashings, but also to do it in a way that solidified their knowledge while doing something that was fun and enjoyable. So I decided to work with the EYO patrol leader and plan several patrol meetings building scale pioneering models. The first requirement in the pioneering merit badge (as in many merit badges) is safety and first aid skills. So part of our patrol meeting would be discussions of potential hazards the Scouts might encounter while participating in pioneering activities. Further, it is an opportunity to teach Second Class Scout first aid skills of: cuts, scratches, insect bites and stings, rope burns, hypothermia, dehydration, heat exhaustion, heatstroke, sunburn, and falls (see 6a of the new Second Class Scout requirements). These are the skills Scout might need when participating in pioneering. So I gathered the material I would need to work with the EYO patrol leader to get patrol meetings planned. I used theTroop Program Features, Volume III (available from Scouting.org), the Boy Scout Handbook, and materials I found locally. In many areas, bamboo grows wild and is most suitable for doing pioneering as it grows straight and the material is sufficiently light, so it is easy for the young EYO Scout to work with (although any wood material will do). Because we had a hike coming up, we combined the gathering of these materials with our hike. We had the Scouts find bamboo sections that were 2.5- to 3.5-feet long. I also decided to use waxed dental floss to tie the lashings, although twine works well. The waxed floss helps hold the lashings and the mint flavor is a nice aroma. I used the EDGE method (explain, demonstrate, guide, and enable) to teach the patrol leader how to tie lashings using scale model techniques. Stitching needles are helpful. Example of a 16-inch model using dental floss. A 36-inch model is more practical for EYO Scouts. The EYO Scouts decided to build a tower like the one shown in this picture. Because there were only three EYO Scouts in the patrol, two Scouts built a side and the third Scout built a ladder (not shown in the picture). They would then join the sides together and attach the ladder, cross braces, deck, and rails. They worked individually as well as a team to assemble their pieces. Just like on large pioneering projects, the importance of pulling the frappings tight was necessary to keep the tower from being wobbly. It took practice, but the boys learned firsthand on their model the importance of a proper (tight) lashing. Further, during assembly, they learned that coordination and following a drawing was important to have the two sides properly marry up. Have the patrol leader or other Scout leader check each lashing to ensure the Scouts properly frapped their lashings tight. Otherwise, your project maybe very wobbly when finished—just like in real life. For the project shown in the picture, I cut 3/8 to 1/4 inch diameter branches with a pair of pruning shears and let the boys use them to cut cross braces. I found a pair of kitchen shears helpful in trimming twigs from the branches. Cut the floss at least 24 inches long to do the lashings. On bamboo, use a coping saw. Bring a box in which to store the project as this activity most likely will take two sessions. Build the pioneering project yourself to get a good sense of what the Scouts will experience as they build their project. And don’t forget to tell jokes from the back of Boys’ Life just to hear them moan and groan as they work. Through this pioneering activity, the EYO Scouts not only enjoyed the fun of building a model pioneering object, they completed several Second and First Class Scout requirements and were well on their way toward the pioneering merit badge. The activity is suited to indoor locations such as the cultural hall or classroom and requires teamwork. When you do this project, your EYO Scouts will walk away with something to show as well as something to be proud of. Have fun and enjoy this pioneering adventure. 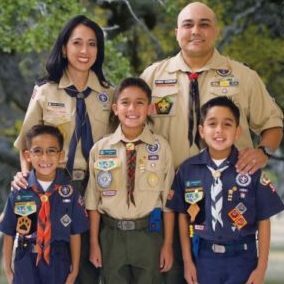 -Stan Stolpe has served in multiple Scouting positions at the unit, district, council, regional, and national levels in the U.S. and overseas. 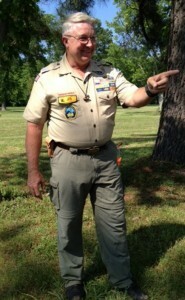 His current positions include assistant district commissioner and district Cub Scout training chairman. He resides in Alexandria, Virginia, serving in the Mount Vernon Virginia Stake. The views and opinions expressed in this message are solely those of the author.